One of the artifacts we’re considering for our book is the 3D printer – not only the MakerBot version, but all types of “bits to atoms” kinds of conversions. The advances in the field are staggering – it is now possible to print human tissue, for example. Every so often, however, there’s a milestone that brings things into dramatic focus. 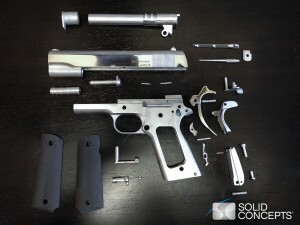 That’s how I felt when I saw this story: First 3-D-Printed Metal Gun Shows Tech Maturity. The company behind the gun, Solid Concepts, has a federal license to make guns, so what they’ve done is not illegal. Rather, they argue in a blog post, they want to prove the efficacy of the approach they’ve taken. A firing test seems to prove them have. What I find fascinating about 3D printers is the how they tie together a physical object with a digital description. More as we get into this chapter, but for now, just worth noting the milestone.